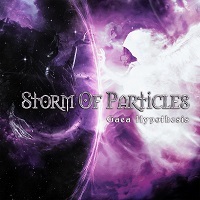 Melodic Death Metal quartet STORM OF PARTICLES formed in Cremona, Italy, in 2015. Following the release of a demo in 2016, they presents their debut full length album, “The Gaea Hypothesis,” which contains nine tracks. “Polarity” is a brief, two-minute, mood setting instrumental opener. Guitars dance about, among some background ambiance that is both airy and ominous at the same time. It segues into “Aurora,” which opens with a slow lumber, and the thud of double bass drum. Mostly driven by a thoughtful guitar riff and low, Death vocals, the melody comes into play from dual guitar harmonies. However, some of the chord progressions stray off the melody line here and there. “Sun Rising in the Fog” is a bit shorter, with a slightly quicker pace, and some harmonies that hit you up front. In this regard it reminds me a little more of a band like INSOMNIUM. The melodies connect better here and it has a more linear sound, including a fantastic guitar solo. “Everlasting” opens with a fragile acoustic guitar line that leads to a riff with some more emotional punch. I’m intrigued somewhat by the similar pacing so far on the album. It allows more of a Doomy sound to rear up in the tracks, which is never a bad thing. The moments however when they stray from the main melody leave me a bit puzzled. “Chronophobia” utilizes many of the techniques we might come to expect in the genre…dual guitar harmonies, a heavy, weighted bottom end, ruthless Death Vocals, and some acoustic guitar for some ambiance. “Of Ice and Hopeless Fate” is another track with an ethereal opening that just doesn’t quiet last long enough for me to really take hold of your emotions before the main riff roars in. However, they retain some of this sound in other parts of the song, which is nice to listen to. “Life Asymptote” closes the album. I think they really hit their stride with this closing track. It seems to embody the sounds that they built on in previous tracks. As the album stands, it is a good debut effort with a promising sound. They have everything that they need to become a major player in the genre, but for me they might just need some more time together and perhaps some branching out a bit that would separate them from their peers.